With meat prices rising and bank balances hanging out in the sub-basement, some less costly protein substitutions are definitely in order. Here are four talented proteins that are super cheap, super rich in nutritional value and–equally appealing–super fast to get to the table. They are canned salmon, eggs, beans and peanuts. I have always loved eggs and pretty much ignored their bad cholesterol rap. Mainly because I just couldn’t believe such a perfect whole food package untainted by preservatives or additives could be bad for you. And sure enough, recent studies show that eggs have been tarnished with an undeserved bad cholesterol label. Officially, they are again healthy for us. They are also one of the least expensive proteins. Not to mention one of the most versatile. A snap to put together (always good), what’s more delicious and vitamin packed than a fluffy omelet sautéed with veggies. 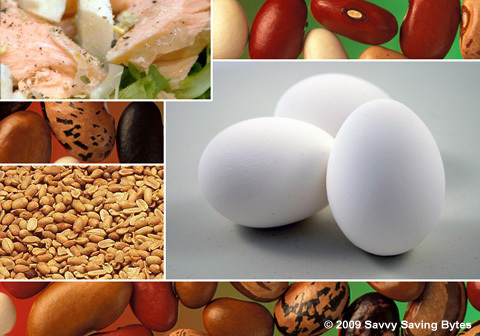 And what protein travels better than hard-boiled eggs in their shells or in egg salad sandwiches. And what protein better serves dieters than eggs, of which two equal a petite 136 calories. (They are one of my 20 Low Cost Slimming Snacks). The second cheap-rich protein is canned salmon, which can’t be beat for simplicity. A couple of turns of the can opener. Then plop! Into a bowl. Then, if it’s my kitchen, it’s combined into one of two complete-meal salads. Either a room temperature pasta salad with fresh vegetables, black olives and vinaigrette dressing. Or a big green salad spiked with tomatoes, peppers, cucumbers and capers. Four ounces of salmon pack a whopping 58% of daily protein requirements, plus an over the top 102% of daily vitamin D needs. Salmon is also chock full of omega 3 fatty acids, also present in fish oil capsules, those little items so often extolled as primo health supplements. Another good thing about canned salmon is that it’s wild. It’s not raised on farms. Listing only two label ingredients-pink salmon and salt — the salmon I buy is caught in Alaskan waters. A refreshing thought. With beans you have two choices. The more expensive canned or cheaper dried beans, which require soaking and longer cooking times. Happily, there’s little difference between nutritional content. Beans are rich in both fiber and antioxidant compounds. The darker the bean, the more nutritious. When combined with whole-wheat pasta or brown rice, they provide proteins comparable to meat and dairy foods without the latter’s high calories or saturated fats. For a one-two-three, soul-satisfying meal (especially on chilly nights) I make up a big batch of soup that hits all the high nutritional notes. First, sauté some onion and garlic, then throw in chicken stock, canned beans (unrinsed–more flavor), canned tomatoes, a medley of thawed frozen vegetables, and a little pasta broken into fast-cooking bits to add a little more oomph. Add bay leaves plus a ton of thyme, basil, and oregano. Serve topped with a snowfall of Romano cheese and you have a great meal all in one pot, with plenty left over for additional meals. And, of course, I also toss beans (rinsed this time) into complete-meal salads. And now we come to peanuts, which are not nuts at all. They are in the legume family, their siblings being peas, lentils and beans. Another not well known fact about them: they are as rich in antioxidants as blackberries and strawberries. In shells or roasted, they make healthy nibbles. And when you’re starving and must eat now, slap together that perennial favorite, a peanut butter and jelly sandwich. Substituting bananas for jelly ups the nutrition content, cuts the calories and delivers a healthy shot of potassium. In place of bananas with peanut butter, you could also try honey, chopped apple or pear. So give your wallets a break, your taste buds a treat and serve this protein packed quartet. Bon appetit!